Bạn có thắc mắc về Bangphlat Resort à? Là nơi nghỉ ngơi chất lượng trong nhà hàng, ngắm cảnh, mua sắm của Bangkok, Bangphlat Resort nổi tiếng phục vụ cho cả khách nghỉ dưỡng và các doanh nhân. Từ đây, khách có thể dễ dàng tiếp cận được nét đẹp sống động của thành phố ở mọi góc cạnh. Một số nơi cho bạn khám phá, Bến tàu Wat Thepnahree, Bến tàu Payap, Wat Thepnari là một trong những điểm du lịch thích hợp cho khách du lịch. Bangphlat Resort cũng đề xuất thêm rất nhiều thiết bị làm kì nghỉ của bạn ở Bangkok thêm tiện lợi. Vì sự thoải mái và tiện nghi của khách, khách sạn trang bị đầy đủ miễn phí wifi tất cả các phòng, an ninh 24 giờ, dịch vụ phòng hàng ngày, quầy lễ tân 24 giờ, nhận/trả phòng nhanh. Chất lượng khách sạn Bangphlat Resort được phản ánh qua mỗi phòng. tivi màn hình phẳng, internet không dây, internet không dây (miễn phí), phòng không hút thuốc, máy điều hòa là một số thiết bị mà bạn có thể sử dụng và hài lòng ở khách sạn này. Bên cạnh đó, khách sạn còn gợi ý cho bạn những hoạt động vui chơi giải trí bảo đảm bạn luôn thấy hứng thú trong suốt kì nghỉ. Dù cho lý do của bạn khi tham quan Bangkok là gì đi nữa, Bangphlat Resort là một nơi tuyệt vời cho chuyến nghỉ mát vui vẻ và thú vị. Inside the living room was too dark for me because it was not enough light. It made me have such a hard time to put the make up on in the morning. The wardrobe looks scary and the mirror on it was useless (It was hard to see or look at that mirror). There was a hair dryer in the wardrobe but no where near it to put the plug in. There was lots of dust on the table in the living room (I stayed 2 nights and the dust was still there on the second day) and also in the bedroom. Anyway, the breakfast and staffs were good. This is by far one of the worst places I have ever stayed. bedroom upstairs and bathroom downstairs. the staircase is OUTSIDE. The stairs were wet and very slippery. the stairs were also small and boards very narrow. DO NOT STAY HERE. The bed was hard as a rock, AC didnt work well, bathroom was horrible and dirty. I stayed 1 night and left in the morning. Absolutely nothing was good about this place. The only thing that was missing was Freddy Krugger. I love the design of the hotel, it's like you're not in the midst of the city. The place is very relaxing. The staff was friendly. Food is just okay. Internet connection is a bit hard to connect to but with decent connection speed. Overall it was a good stay and will recommend to anyone. Nice and quiet place to stay, teak houses are a nice experience but not really a must see. Staff was very friendly and attentive, but it seemed like only one person per shift was able to speak English. So, everytime I had a question the girl in the coffeeshop or at the breakfast table had to call the manager in order to translate...but no difficult things, you should expect someone serving breakfast to understand "fried eggs please, not scrambled". Location is far from the airport. The easiest way is to commute in an airport train up to Phayathai. A very good place to relax away from the crowded city life.The staffs are very helpful to assist everything our needs especially the easiest way to reach other tourist spots. It's near Taling Chan Floating market. So bad, always on traffic jam because of road construction near the hotel. 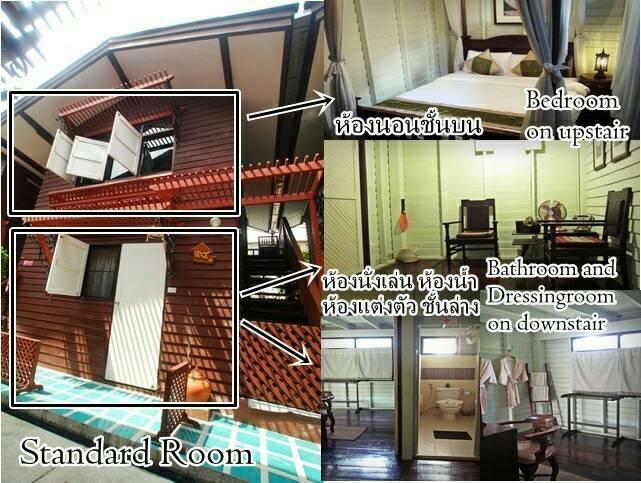 This guesthouse is beautifully decorated in the thai vintage style. Each room is a little different and the beautiful wooden furniture and decorative touches make you feel like you have stepped into the past. The room we stayed in was a two floor apartment style and it was beautiful and very comfortable. the only issue I had was with the bathroom being downstairs and the staircase is located on the outside so if you needed to use the bathroom at night you needed the key and to be outside of your room so obviously needed to be dressed as such. Upstairs is the bed room and a study room with desk, downstairs a dressing room living area, although the TV is upstairs, and bathroom. I decided to stay at a Thai style hotel away from BKK city centre and thought this boutique hotel would be a nice change. Unfortunately I only stayed one night instead of the two I had paid for. This was because of several reasons. Mainly the WIFI was bad so I could not use it in the room. The room was also quite small and old with no safe only a small locked cupboard. The bathroom was old and small and the bed was very very hard. The old TV worked quite well and there were some English programs but there was very limited work surface space to sit and use my computer. The staff were excellent but I would rate this as slightly above a backpacker hotel and for about the same price Ibis or even Red Planet are better options. We stayed at this hotel on 4 occasions each time we left Bangkok to travel and then returned for a few days. I recommend they change the wording describing the accommodation as it is better than described. Their wording says the deluxe rooms have shared bathroom facilities which will put a lot of travellers off as it sounds like one bathroom is shared by other clients. THIS IS NOT THE CASE. You get your own detached lodge which contains two floors. The lower floor consists of a sitting room with 2 chairs, coffee table, fridge and electric fan, a separate bathroom/shower room and toilet with hot showers, also a dressing room supplied with clean robes and towels. The upper floor has a double bedroom with a firm 4 poster bed, good air conditioning and occasional furniture. There is also another room adjacent to the bedroom with a chair and desk. The rooms are made over and cleaned everyday with new towels etc, and although the accommodation is clean and comfortable it is a little tired but this didn't bother us. The only downside is going downstairs to the bathroom if you need to go to the toilet during the night. They serve mostly Thai food but they offer a sort of Western breakfast which could be greatly improved. They call it the American breakfast served with fried eggs, sausage and salad. Although you can ask for boiled eggs or an omelette as an alternative. There is no cereal on offer and fruit isn't offered eeveryday which is disappointing. The hotel offers good value for money and the staff are very friendly. We stayed here 4 times during our 6 weeks holiday and we would stay here again if we come back to Thailand. Don't be put off by their wording of 'shared bathroom'. Of all the hotels I've stayed at in Bangkok, this was my best overall experience. Set well back off the Road Under a canope of Tall Trees Bangplat Resort is a Paradise in the middle of Bangkok. Consisting of Individual Traditional Thai Teak Cottages Set in a Tropical Garden, with trickling Water falls, and Melodic Songbirds to greet the weary traveler in the morning Bangplat Resort was the most relaxing Hotel stay ever. The staff was more than helpful, ready to fulfill me every need and request, and I'm a pretty demanding Guest. Everyone Speaks perfect English, so egnor any previous reviews that said other wise. Not located in the center of Town the tranquility is worth the 10 minute taxi ride to the heart of Bangkok. the staff was very kind and helpful. the guest house provides main basic facilities for a pleasant venture. little bit out of places where travelers like to go. koa san rd quite some walk away. tuk tuk or taxi not so easy to catch. I had a pleasure staying here, eventho it's quite far from the Sky trians or Metro (which soon will be operated near the resort so by next year or 2 this place will be great for staying and traveling around BKK) The staffs were very nice, I like that the kitchecn is Halal so i really feel comfortable staying here. if you need anything or want to go anywhere just ask staffs. The room is absolutely wonderful, I really love it and enjoy the atmosphere. This was our second stay at the Bang Phlat Resort during our two weeks in Thailand. After the debacle at our hotel in Ayutthaya, we decided to return to Bangkok a day early, and even though the Bang Phlat Resort was quiet busy they were very happy to book us in an extra night at short notice. Wonderful place, wonderful people. Will definitely stay there again should we go back to Bangkok. Bang Phlat is not an obvious choice to stay in Bangkok but now that we've done it I can highly recommend it as its a real Thai neighbourhood somewhat off the beaten track. Bang Phlat itself is a 10-15 minute bus ride (6 baht, an experience in itself) from Khao San And Rambutree or you can catch a water bus by the Ratchawithi bridge and travel all the way down to Thon Buri and the temples at Wat Arun. Stick food (deep fried food on sticks) rules along the busy Charon Sanitwong road which runs through Bang and street vendors also sell the local delicious iced tea cha yen, made with ice, strong red tea leaves and evaporated and condensed milk. The Bang Phlat Resort however is a hidden gem of comfort, tranquility and luxury in this bustling neighbourhood of Bangkok. Bang Phlat resorts quaint traditional wooden houses boast two double bed rooms each (ground floor and first floor) with bathroom, air conditioning, free wi-fi and beautiful wooden furniture. Breakfast options consist of Thai rice soup with either chicken or shrimp, both of which are delicious or alternatively American breakfast is available. Tesco Lotus is virtually opposite the entrance to the hotel and there's a small shopping mall with some restaurants should you want something more substantial to break your fast. I have to say that I was over the moon with the quality of my stay at the Bangplat Resort in Thonburi. Excellent rooms at a price that is hard to beat. I would seriously suggest to all people needing a room in this area to consider the Bangplat Resort. The Bangphlat Resort consists of a 'soi' of traditional-style 2-storey wooden Thai houses. Downstairs was a lounge area, dressing room and bathroom; upstairs was a work room and a bedroom. The two levels were linked by an external wooden staircase. While this was full of atmosphere, having to go outside in the middle of the night to go to the bathroom was a bit of a surprise - but we coped! 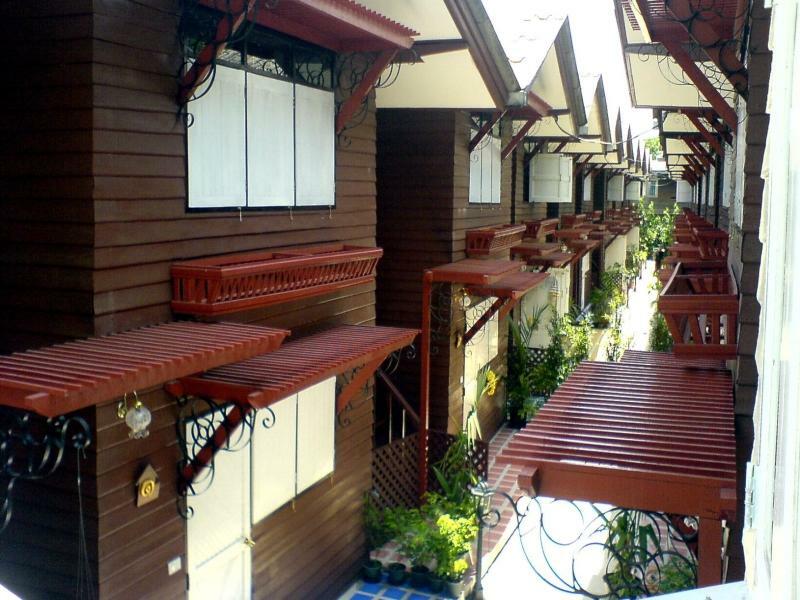 The whole resort was very green, simply but nicely furnished, with great atmosphere. We enjoyed two days here very much. Generally the Resort is quiet, though the rain on the first night also dampened sound; on the second night, some neighbours right across the next alleyway talked and watched television loudly for much of the night, and this carried strongly (it wasn't raining then). The area is interesting - 'old Bangkok' to some extent. It is a short walk to the river, there is a Tesco supermarket and food mall close by, and it is interesting to see Bangkok away from the tourist areas. Management were very welcoming and obliging and good meals were available on site. We'd recommend this to friends and other travellers. very impressive for good hospitality and warm welcome when we arrive in resort. 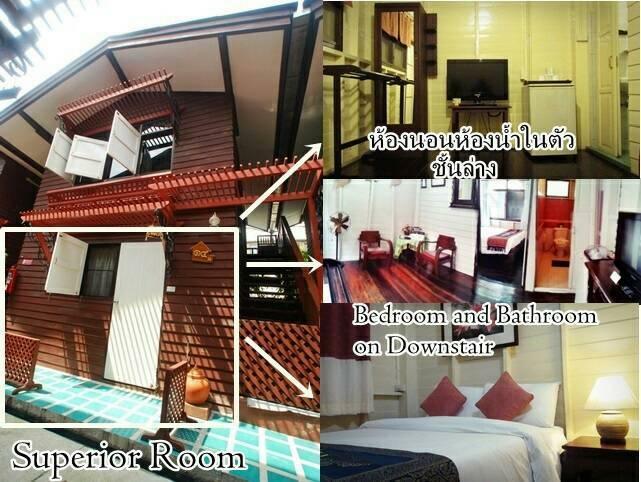 about the facilities of resort, bedroom is upstair and restroom is downstair quite not convenient but it is okay. For dinner with buffet, it is good taste for buffet. All staff are very nice. For breakfast, a little bit quantity. the parking is very good, they have security. We stayed here as a vacation from Bangkok (live in Bangkok). We wanted a place to explore Thonburi from and this was perfect! It was out of the way of the main touristy areas though if you are trying to visit Bangkok on a budget but want a relaxing, clean and friendly place to stay out of the main areas this is perfect. You'll need to take a cab to get to the main touristy areas but the area around the resort is local and has a great local feel to it. The breakfast was okay (American breakfast) though chicken and rice looked good. This was a pleasant surprise I'd recommend! If you wanna go somewhere to charge your life, you should be here. 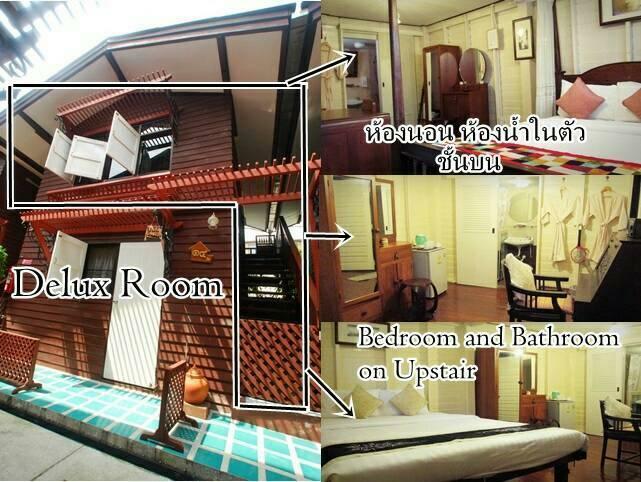 The resort has 3 rooms, very suitable for family gathering but the only cons is that toilet is seperated from bedroom. Toilet is small too, no space to hang clothes during shower. Other than that is a spacious & clean place to stay.